Sorry I don't have my own pictures for this one; it was seat-of-the-pants -- but so delicious, I just had to share! I knew I had some dried tamarind pods, but while seeking those (which I was able to revive and clean the pod casings off of by dipping them in hot water -- any suggestions on what to do with them? ), I found some rolled guava paste from Trader Joe's. Which, not incidentally, is probably my favorite chain store ever, but I live no closer than 350 miles from one, which depresses me. Another hit against Idaho, which this year is slightly redeeming itself by having remarkable skiing and increasingly impressive restaurants in Sun Valley. Come visit! The guava paste was pretty dried out -- I was a little scared to look at the expiration date, so I didn't, but they *were* individually wrapped. I put four of the little rolls (about half an inch by 1.5 inches each) in a small bowl and topped them with boiling water to attempt a rehydration. They sat in that for several hours as I finished work, then went in a tiny Cuisinart blender with about half a cup of orange juice. It took a lot of chopping and grinding to get the guava rolls to achieve a smooth texture, and more to get the same texture out of the large chipotle pepper (canned in adobo) that I added after realizing the mixture was just too sweet. I also added a few grinds of salt and pepper and about a tablespoon of balsamic vinegar somewhere in there for umami. In a large stainless steel skillet, I heated olive oil and a dash of salt on medium high until a drop of water sizzled, then tossed in some boneless chicken breasts (because of their large size, I cut one into three pieces and the other into two pieces lengthwise). I seared them on both sides, then poured on the guava sauce, reduced the heat to medium, and cooked until the chicken was done. Then I poured in about 3/4 cup chardonnay to deglaze the pan, and let it boil down for oh, three minutes or so before plating atop the chicken. Thinking back, a light red wine might have been a richer choice, but I liked the clean flavor the white gave the sauce. Meanwhile, I cooked quinoa in our *amazing* wedding-gift rice cooker. Which I believe is the first time I've cooked quinoa in my adult life -- but it worked out remarkably well, despite smelling odd during the first half of the cooking time. With the Costco-sized bag of dried quinoa I just opened, this IS happening again. In a small saucepan, I melted 1/2 tablespoon of butter and two large pressed cloves of garlic. I added about a cup of organic canned corn, a little salt and pepper, and some fresh thyme from the plant the husband and I were given by the B&B where we spent our short honeymoon, which has survived on the windowsill despite minus temps outside. Then after a few minutes, a few tablespoons of half and half. I'd have used cream, but this was a spur-of-the-moment dish, and I had to go with what was in the fridge. ...and the result was -- DELICIOUS. The barbecue sauce was hot, sweet, umami-esque, perhaps the best non-tomato-based BBQ sauce I've ever had. The corn mix on the quinoa an excellent creamy foil. I think the only thing that would have made it better would have been a spicy greens salad on the side for a fresh, crispy bite, or perhaps some pickled radishes. Very cool! I like your resourcefulness in the kitchen! I too wish I lived near a Trader's Joe. 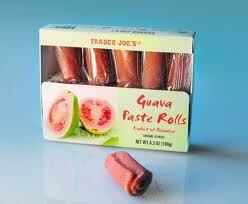 These guava paste rolls look great. We have a similar thing in the middle-east called amardeen, it is apricot leather and so delicious. I love what you ended up with. Great dish.